Spring is definitely here. Not only are the trees leafed out but the flowers are in bloom and insects are everywhere. In the birding world, many of our winter visitors are headed north for the summer. The Orange Crowned Warbler that was fighting with its image in our car’s windshield is gone. Either something ate it or it is headed north to the Boreal Forest. I hope it is the latter. Red Winged Blackbirds, absent in the winter, are back from Mexico and are dominating the feeders. For a few days we had a male Ruby Throated Hummingbird visiting our feeder. It too has returned from the tropics and is headed north and quite possibly to Canada. The ducks are still here, but if the past is any indication they will be headed north to the prairies in a few weeks. Birds sometimes provide a little bit of excitement and this week has been one of those times. My wife had been doing some puttering in the yard and was in and out of our shop/shed leaving the door open all the while. In one of her brief absences a Chachalaca decided to check out the shop where my wife surprized it (and herself) when she returned. My wife used a broom trying to usher it outside but with no immediate luck as the bird kept flying at ceiling level and complaining loudly. Eventually, the bird got tired and landed on the floor near the door. Here it “saw the light” as it were and flew out in a hurry. It joined the rest of the flock behind the shed and squawked loudly for several minutes seemingly complaining about its recent ordeal. Bird brain? This area of Texas has a plethora of wading birds, so this week I am featuring a family of waders called ibises. 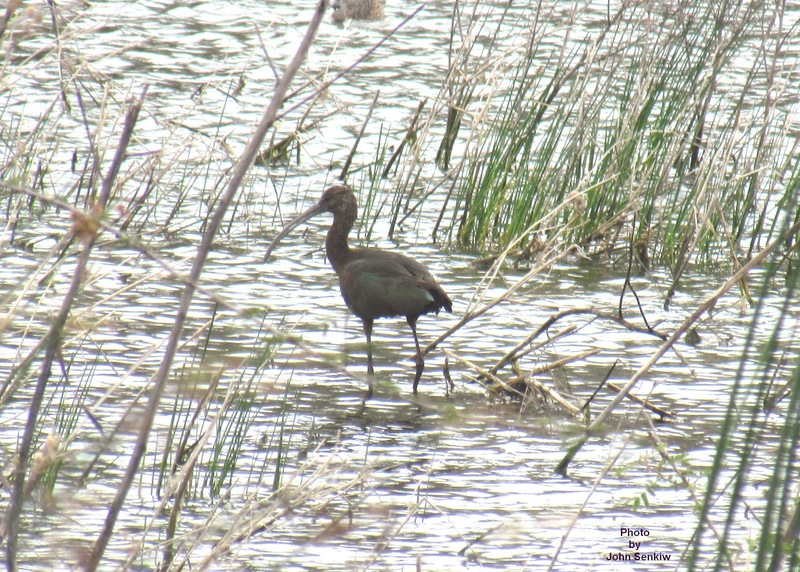 There are only three of these chicken - sized (small chicken) ibises in North America and all are found only in the deep south of the USA. 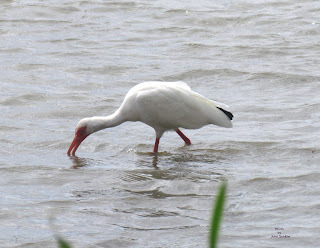 Two, the White Faced and White are common here; the Glossy is a rarity in Texas but is common in Florida. All three have long down curved bills which they use to search for food in shallow waters and freshly irrigated fields. 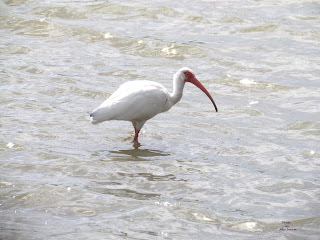 The White Ibis is all white and is unmistakeable; the White Faced Ibis is all black and easy to separate from the White. The Glossy and White Faced are almost identical and only a very experienced birder would venture to determine which is which in the field. The White Faced has some white markings at the base of the bill which are really only visible during breeding season. The Glossy is no glossier than the White Faced so some very subtle markings must be noted. 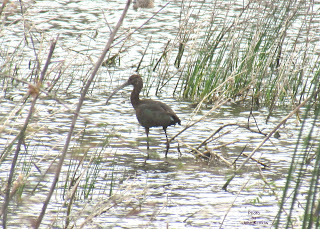 Fortunately, the Glossy is so rare around here that one just assumes that a black ibis is the White Faced. I took both photos just this past week. 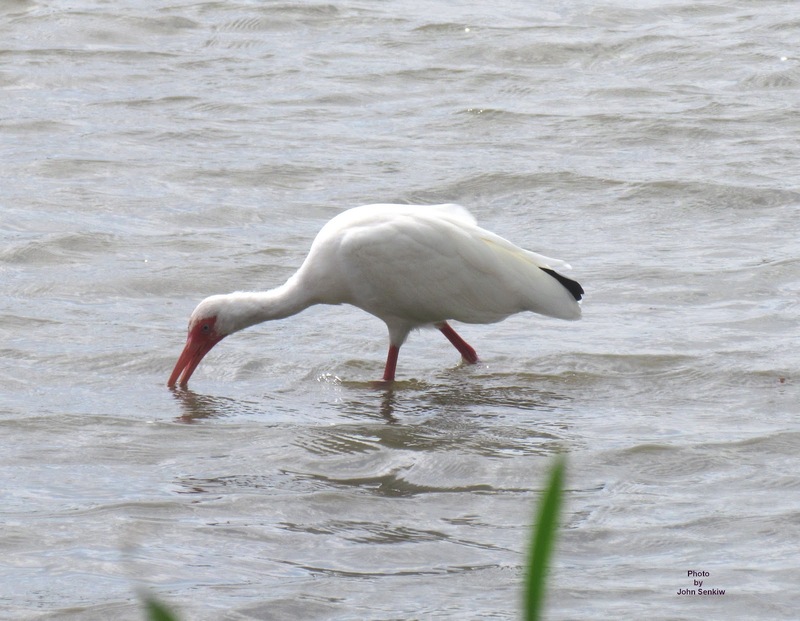 I got the White Ibis at Llano Grande State Park in Weslaco and the White Faced at the Santa Anna Federal Nature Preserve along the Rio Grande River. Both places are close to our trailer park.